When we synchronize with one another, we connect with our own essence. 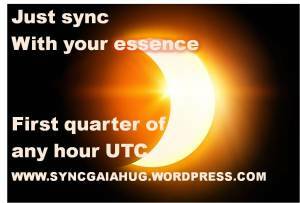 Please choose a time to sync everyday, in the first half of any hour Universal Time Coordinated. Like time on our earth, we coordinate as well. Please share this message with all. Gaia is calling. I have a stone connection with someone Here both of us have a small stone and keep it on heart thank universe for everything and remember each other, every day before sleep.